You can easily download and add the kav_rescue_10.iso or krd.iso file to your E2B drive easily. Just copy it to the \_ISO\MAINMENU folder. Note: The KAV Rescue 2018 ISO does support UEFI-booting so you could convert to .imgPTN file. When you first run it, you will want to update the virus definitions. When you do so however, it will store the updates on the internal 'target' hard disk of the system that you booted the E2B USB drive from, instead of storing them on the E2B USB drive. This means that when you boot on a different system, you will have to download the updates all over again (if the system has an internet connection). Previous E2B versions included a Kaspersky_Rescue_10.mnu file in the \_ISO\docs\Sample mnu Files folder. However, the instructions in the .mnu file were not to too clear. Actually, you don't need a .mnu file at all. IMPORTANT: The key to the whole procedure is to ensure that Kaspersky linux mounts all the storage devices as volumes by selecting a drive to scan FIRST. This will not be done if you do not select a drive to scan when prompted, or if you use the 'Skip' button when prompted if the volume is 'dirty'. Once all the volumes have been mounted, you should see the icons on the Desktop - if not then it won't find the Updates on the USB drive and you will have to reboot! Make sure you see desktop icons for the USB drive (e.g. sdb1). 1. Download a recent ISO file from http://support.kaspersky.com/viruses/rescuedisk#downloads - it should be under 'Distributive' and called kav_rescue_10.iso or krd.iso. 2. Copy it to a menu folder, e.g. \_ISO\MainMenu folder (or \_ISO\ANTIVIRUS or any other menu folder where you want it to be listed). 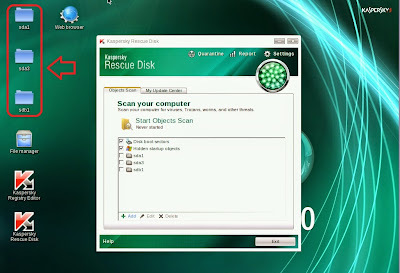 Create an empty folder called "\Kaspersky Rescue Disk 10.0" on the E2B USB drive now. Note: For krd.iso 2018 versions, the folder name has changed to \KRD2018_Data. 3. Boot from the ISO menu entry. Ensure that your USB drive (sdb1) volume has been mounted and appears as an icon on the Desktop as well as the C: drive icon (don't abort any dialogs!). If they are not there then reboot and try again. On first boot to Kaspersky from E2B using this menu, download the updates (you will obviously need an internet connection). They will usually be automatically stored on internal Hard Disk C: by Kaspersky but if it finds the "\Kaspersky Rescue Disk 10.0" folder on the E2B drive, it may copy the updates there instead. 4. When the download of the updates have finished, if the USB \Kaspersky Rescue Disk 10.0 folder is empty, copy the whole "\Kaspersky Rescue Disk 10.0" folder which now contains the updates from C: or sda1 (the internal HDD) to sdx1 which is the USB drive partition 1 (if you only have one hard disk, the USB drive will be sdb1). Now rename the "C:\Kaspersky Rescue Disk 10.0" folder on the hard disk to something else like 'Junk' to get rid of it. IMPORTANT: Ensure the update folder \Kaspersky Rescue Disk 10.0 does NOT exist on the Target hard disk in any volume. It must only exist on the E2B USB drive, otherwise it may update the wrong folder. 5. On the next boot, the updates should be found to be already present on USB drive (check you can see the drive icon on the Desktop). 1. Ensure you can see the sdx1 icon on the Desktop to show it has been mounted as a volume by Kaspersky. 2. Ensure any target system you test does not already have the \Kaspersky Rescue Disk 10.0 folder anywhere on any HDD in the system - if so delete it and reboot from USB. Always shutdown Kaspersky linux nicely or updates may not be saved! Converting the ISO to a FAT32 .imgPTN file is easy, however the \KRD2018_Data folder is not found by Kaspersky Rescue if it is in the boot partition, so we cannot simply create this folder inside the new .imgPTN partition. If your E2B USB drive has two partitions then simply create an empty \KRD2018_Data folder on the 2nd partition of the E2B drive and use a .imgPTN23 file extension. 1. Create an empty folder called KRD2 and inside it create an empty folder called KRD2018_Data. Drag-and-Drop and KRD2 folder onto the MPI_FAT32 desktop shortcut and create a 300MB file called krd2018 (with no file extension). 2. Drag-and-Drop the krd.iso file onto the MPI_FAT32 desktop shortcut - use the default size. 3. Rename the krd.imgPTN file to krd2018.imgPTN. 4. Copy the krd2018.imgPTN and krd2018 file to \_ISO\ANTIVIRUS on your E2B drive. 8. (optional) If your Windows allows you to access the second 200MB partition, you can delete all files from it except for the \KRD2018_Data folder just to keep it tidy. If updates do not appear to be persistent, delete any folder on any drive named \KRD2018_Data except for the folder on the second partition of the E2B USB drive (i.e. delete the folder from all drives in the PC\Notebook so that the only folder of that name is on the E2B 2nd partition). yes, that is what this blog says - did you not read it! KRD2018_Data is created on sda4 although exists on sdb3? What am I doing wrong? All I want to do is extract files from an ISO! Easy2Boot will soon support UEFI booting! End of Windows XP - good news for some?